PRE-ORDER : CDs are in stock now. Download cards and stickers have not arrived yet. Orders will begin to ship when they arrive here. Respected reggae elders represent in classic style while young veterans and up-and comers surprise with fresh twists through fourteen vocal tunes and two instrumentals on the first one-riddim album from Stubborn Records' Version City Rockers. 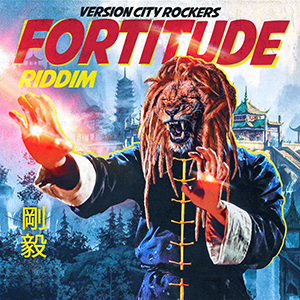 "Fortitude" presents wicked roots reggae and dub immersed in Rastafarian Niyabinghi drums, providing the backdrop for 16 smoking and very varied interpretations. True to the title, this riddim never lets up, reminding us that with all of the uncertainty in the world, we must always stick to our principles. With each track lovingly treated and carefully and individually mixed, the album plays like an extended piece in movements, steadily evolving over the deep and steady groove. From the beautiful, conscious lyrics of reggae and dancehall legend Johnny Osbourne's "Let There Be Love" through producer King Django's breakneck flow of wisdom, "The More I Learn," and the sultry, dreamy sounds of original rocksteady master Carl Dawkins' "Tranquility," Fortitude goes down like a super-relevant tonic against today's troubled times.